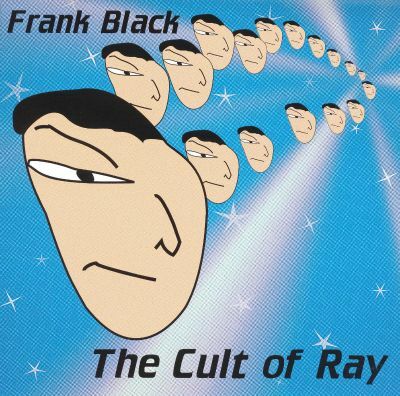 Frank Black’s third solo album, The Cult of Ray, brings in David McCaffrey on bass and Scott Boutier on drums, who would remain in the lineup throughout the Catholics albums. Lyle Workman is still there on guitar, but Joey Santiago doesn’t contribute anything to this one. I believe it’s also when Frank started experimenting with recording live to two-track instead of playing different parts separately and then mixing them together, although there are a few overdubs on this record. The title is another reference to Ray Bradbury, bringing the science fiction influence front and center. Perhaps unsurprisingly, he relaxed these themes a bit after this album. The Marsist – Starting out with a spoken-word bit, this somewhat distorted song is about a guy who wants to go to Mars (not an uncommon theme in Frank’s songs) and see the stone face. Of course, the face only really looks like one under certain lighting conditions, but the narrator here is obsessed with it. Men in Black – Definitely one of the catchier songs on this album, it addresses the topic of the Men in Black before the Will Smith movie came out. I’m not sure when the term first originated, but apparently reported sightings of men in dark suits who intimidate people into not telling others about UFOs dates back as far as 1947. They must not have been all that effective if the people telling these stories mentioned both the UFOs and the enforcers themselves to the public. If Wikipedia is to be believed, the term was specifically used in a 1980 movie, but I don’t know if it had appeared before that. The song’s lyric “Are they grey or is it my own nation?” questions whether the titular men are aliens themselves or government agents tasked with hiding the existence of aliens. The song also refers to UFOs as “dinner plate specials, the shapes of cucumber,” but I first heard it as “the chef’s a cucumber.” There’s a video for this, which includes Frank making peanut butter and jelly sandwiches for the band during the instrumental break. You Ain’t Me – Frank has said the main riff was inspired by Tommy Tutone, and you can certainly pretty easily sing “867-5309” to it. It’s probably mostly memorable for using the adjective “masturbatory,” but there’s also a nice shout-out to Lewis Carroll. Jesus Was Right – A really catchy number from the point of view of a kid who skateboards and plays guitar and feels alienated from society. The title doesn’t seem to be about religion so much as it is about embracing pacifism and solitude. I Don’t Want to Hurt You (Every Single Time) – I believe Frank has referred to this slower song as something he hoped everyone could identify with, and I think it works. It’s a sincere if somewhat meandering apology for just about anything that unintentionally goes wrong in a relationship. There’s a nice meta-reference with “the chorus was pretty much the same every time I wrote this song.” The “what’s-her-name” mentioned in tandem with King Kong is presumably Ann Darrow, played by Fay Wray. Mosh, Don’t Pass the Guy – A rather frantic instrumental that I think might have been named by John Flansburgh of They Might Be Giants, or at least inspired by him. I know he used to refer to crowd-surfing as “pass the dude,” and was never keen on it. I get the impression Frank probably didn’t like it much either. I believe this has been performed with lyrics, although they’re actually just the title repeated over and over. Kicked in the Taco – There seems to be a general theme of trying to avoid violence running through this album. Based on a brief Google search, the titular phrase actually refers to a woman being kicked in her genitalia, but Frank has said he took it from a Crispin Glover movie. I have heard that tacos are one of his favorite foods, and it allows him to rhyme it with both “Morocco” and “sirocco,” so maybe those are contributing factors. The sirocco is a Mediterranean wind, and “albondigas” is Spanish for “meatballs” as well as being a Mexican soup that contains them. And no, I’m not sure how they relate to the song. The Adventure and the Resolution – Another instrumental, but it’s more complex than “Mosh.” I can’t tell if there’s supposed to be a clear divide between what’s considered the adventure and what’s the resolution. Dance War – I get the impression fans don’t care for this one too much. It’s not one of Frank’s better songs, but it’s not bad either. It takes another look at violent dancing, and while we were told earlier on the album to mosh rather than passing the guy, this one makes it sound like moshing isn’t necessarily a good idea either. The narrator here seems to be using the mosh pit as a way to work out aggression. The Cult of Ray – The title track is one of the best songs on here, being catchy and also seeming rather meaningful, although I can’t tell what a lot of it actually means. Part of it has to do with Frank hearing Bradbury speak, and taking his philosophy to heart. There’s a theme about how humanity is destroying the world, but that doesn’t mean I have any idea who the old man in a coffee can is. I’ve read a few things by Bradbury, but if any of the more cryptic lyrics are references to his work, they aren’t to anything I’m familiar with. This entry was posted in Albums, Frank Black, Music and tagged crispin glover, david mccaffrey, fay wray, joey santiago, john flansburgh, lyle workman, mark knopfler, mars, men in black, ray bradbury, scott boutier, shazeb andleeb, the cult of ray, tommy tutone. Bookmark the permalink.